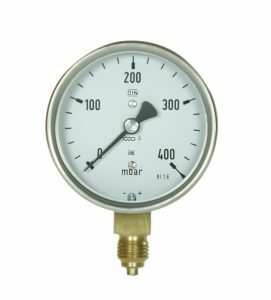 The TEMPRESS capsule gauge was developed as a supplement to TEMPRESS low pressure gauges. The Capsule gauge is for measuring air, other nonaggressive gasses, and vacuum within ranges 0-600m.BAR. Bezel DIN 1.4301 (AISI 304). Triangular bezel and fixing clamp. Connecting thread in accordance with customer requirements. Nylon capillary for remote indication. Built-in Contact Systems (Ø100/160 only). Built-in Opto-Electronic Transmitter (Ø100/160 only). Capsule Gauge Ø160 only on request. Front: Stainless Steel DIN 1.4301(AISI 304). connection 22 A/F dia. 63 mm1/4″ BSP, 14 A/F rear center. Ambient temperature changes result in an indication error of+/- 0.3%F.S.D. per 10 deg C.
Temperature DIN 16055 resistance Soft solder max. 60 deg C. standards.